EVEN THE HEALTHIEST LAWNS WILL BENEFIT FROM CORE AERATION. Lawn core aeration is a vital lawn service for healthy grass. It consists of the removal of small cores of soil that allow air, moisture, and fertilizer deep into the root zone of your lawn. 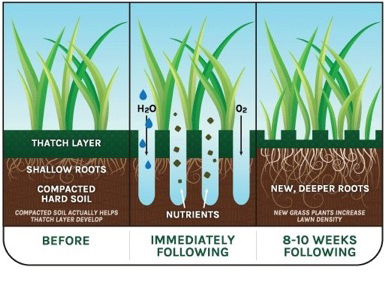 This process reduces compaction, increases organic activity, and helps to prevent thatch buildup so your grass roots can grow deep and strong. We recommend a core aeration each fall season. For expert core aeration and other lawn care services, please contact us today!